Lovell Johns launches Planvu 3! With an increased appetite for online information on the part of citizens, and a general growth in interactive mapping provision by councils, the way Policies Map information is delivered by councils is changing. With more mapping available through mobile devices on APIs such as Google Maps and Bing Maps, and open source software growth, developers have had more opportunities and routes to explore than ever before. 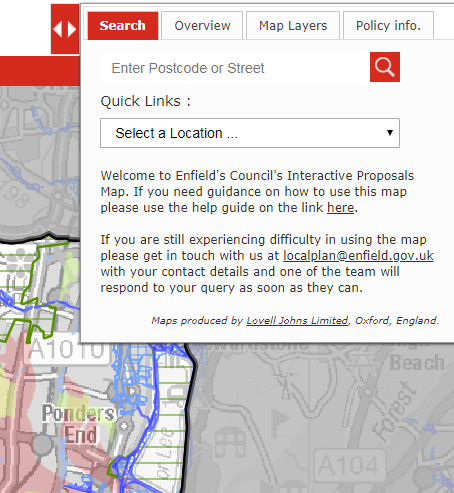 An online Policies Map has the advantage of providing very large scale searchable mapping for the whole of the borough or district that would not be possible for a paper format map and linking this to appropriate planning policies. Planvu is Lovell Johns’ own open source web mapping software that facilitates increased user engagement by providing the public, developers and council staff with free, intuitive mapping information around the clock. Planvu can be updated quickly in comparison to a printed map as solutions hold a library of files which can be easily updated and amended for a new policy or layer of information. 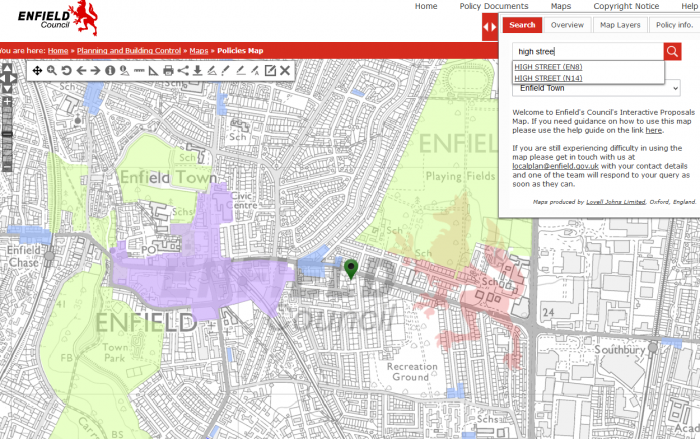 We recently rolled out our latest version of Planvu to London Borough of Enfield Council, providing developers and the local community with a clear guide to planning policies in the Borough. We’ve come a long way from Version 1, released in 2007, and Lovell Johns currently hosts around 20 Planvu solutions for councils across England and Scotland. Planvu provides an interactive, intuitive map of planning policies all the way down to property level. So one can search for a full address and links to detailed planning policies.. Whether you’re browsing on a mobile device or desktop, viewing the map and getting to the analysis is probably your first priority. We’ve added code to ensure that you can now hide the Legend Panel, so the map fills most of the window as seen below. With more user-friendly iconography and better control, you’re better equipped to query policy data, employing several different methods. The icons and buttons on the map interface are quite intuitive, and it’s much easier to manipulate the map, whether you’re plotting specific areas, measuring distances, or just want to examine a particular point more closely. Of course you can completely reset the map as well to its’ original state. When you search for a town, postcode or location you can either use the Quick Links panel to get to the area you’re looking for or use the Search function. Just continue typing and Planvu will complete your search query, checking through the database for all possible locations. 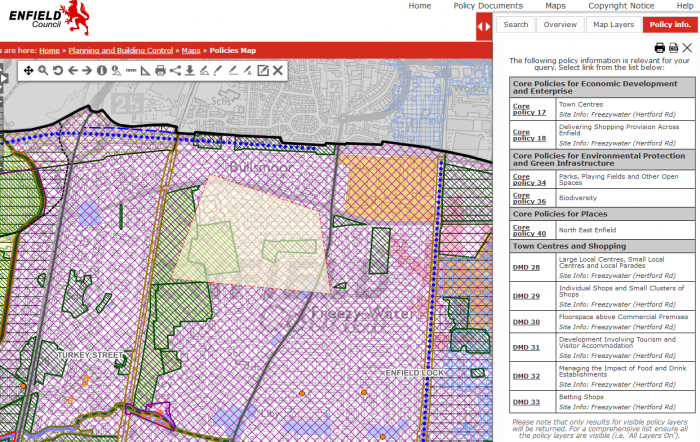 The online map has the advantage of linking to specific policy text from embedded links within the map meaning the user can quickly read up on the planning policies applicable at the search point rather than have to refer to a separate document. We’re very excited to roll out all of these changes, and we’re looking forward to continuing to support Local Government Policies mapping and solutions in the future.